How Do I Make My First Online Survey? You're tasked with creating your first online survey and have no idea where to start or how to go about it? Don't worry the process is simple and painless and there are a range of great tools to suit an even wider range of requirements. Conducting an online survey is dived into 3 basic steps. Making the survey, sharing your survey and analysing results. Your survey can be anything from a few questions in an email to a series of questions designed to look and feel like a part of your website. It might be tempting to ask your questions in an email or spreadsheet but you're going to run into problems with response rates and make your job difficult when analysing results. Shameless plug: Even if your requirements are simple many tools like ours are free for the first month. 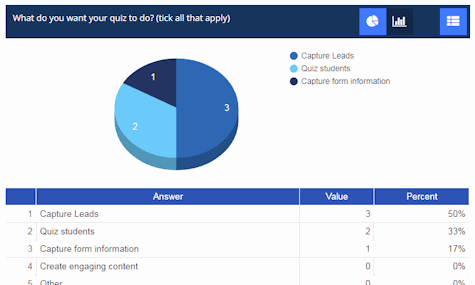 An online survey maker will simplify the subsequent steps of sharing and analyzing results but more importantly it will produce a survey which is easier for your participants to respond to. Most online survey makers have a range of features which are designed to improve response rates and make it easy for your participants to respond. You're conducting a survey because you want to learn something. The more responses you have the more statistically accurate your results and subsequent lessons learned will be. Response rates to online surveys have consistently dropped since the mid 90's. Keep this in mind at each stage of developing your survey and make it as short and easy to respond as possible. Check out our tips to improve online survey response rates. Can the survey to be integrated into our website? 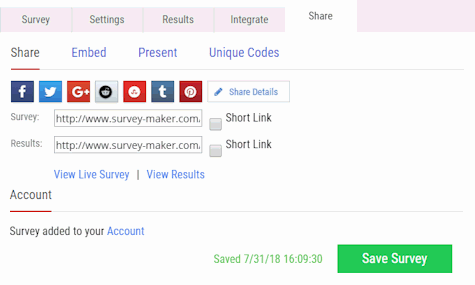 Will I be creating 1 or many surveys and if so is survey creation easy? Will multiple people be managing surveys, if so is this possible? Can I tailor the look and feel to match my requirements? Do I want my survey to be embedded or hosted (explanation below)? Does the survey work on mobile phones, tablets etc? Does the survey work with my method of sharing (email, social media etc)? Do I need to automatically integrate results into our existing software? Can I understand interpret results easily? The following instructions apply to our survey creator, the entire process takes less than a few minutes for even moderately long surveys. We assume you already have your survey questions in mind when beginning. Type your first question and add your options. When you select the question you'll see a toolbar appear with a range of buttons. The toolbar allows you to change question type, add logic and manage other settings. Hit 'Add question' and select your question type. Continue to do this for all of your questions. Hit the 'Settings' menu. From here you can manage the behaviour of your survey as well as change the look and feel in with the theme editor. You don't need to enable or disable anything as all of the defaults work but you can tweak to suit your requirements. Before sharing your survey you'll need to consider how you're going to get in touch with participants. Personalised emails work well and if it's possible pre-contact your participants to let them know you're going to ask for their participation. Alternatively if you're trying to engage feedback on your website then you or your website administrator going to be embedding a piece of code in your website content editor to display your survey on your website. If you're sharing via email you need to copy the survey link. This is a link to your live survey. If you want the survey to appear on your website at the top of the Share screen you'll see an Embed menu item. Click this and copy the Code. This is what you'll paste into your website content editor. Your participants are responding and your survey has been a success. How do you now dig though responses for your precious nuggets of information? Login to the dashboard and click the title of the survey you're working on. To access our integrated reporting click the 'Results' button. From here you can see a summary for each of your questions. You can hit the export button to export your results to a spreadsheet or HTML file for further analysis. The Responses button allows you to see and manage individual responses. 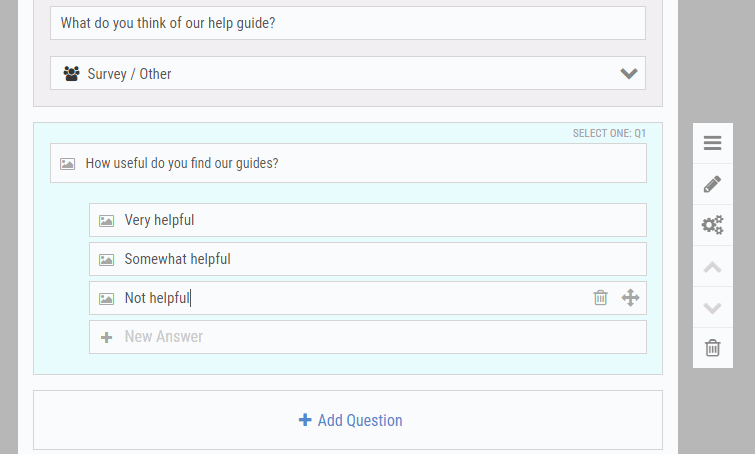 Survey logic allows you to hide, show and skip to certain questions depending on the answers your participants provide. Imagine you have a multiple choice question asking how satisified your customers are with your service. You may want to ask a follow-up question if your survey taker answers extremely dissatisfied. Survey logic allows you to do this. Your response rate is simply the number of people that have responded divided by the number of invites you've sent out. It varies wildly depending upon the purpose of your survey, industry and many other factors. We've compiled a bunch of tips to help you improve your response rate. If you intend to run your survey on a regular basis it will make a lot of sense to automatically process your results. You may want to send results directly into your customer service management software or email relevant staff when you receive certain responses. This is achieved via an API which is a technique for allowing two different software packages to talk to each other. SSL Encription is a process websites use to ensure communication between a visitor (or survey taker) and the website host remains private and readable only by the two parties. You can tell your Survey is SSL encrypted by ensuring the address starts with a 'https'. Privacy and confidentiality are important to survey participants and this is now considered a minimum industry standard. Hosted and embedded refers to where the survey is taken by your participants. An embedded survey is taken on your website by 'embedding' a piece of code which displays your survey as part of your website. A hosted survey is one which can still match your branding but is taken on our website. We haven't seen a difference in response rates between the two and a hosted survey is a much simpler proposition. Piping allows you to take an answer and use it throughout your survey. You might ask for a participants name and want to personalize a later part of your survey by addressing them by their name. You can achieve this by using survey piping. Open the advanced editor by hitting the 'icon'. You can insert a previous answer by hitting the 'Answer' button.